Last week I received my “Pastor ID.” It is an official card that states that I am a licensed pastor. Armed with my clerical collar and this card, I can skip lines, bypass army checkpoints, and abuse my power as a religious man. It is weird. I know that inside my wallet there are two ID cards now. There is my regular Lebanese ID. Then there is my secret pastor’s ID with super powers. Is this how Jesus felt while on earth? He was God in flesh. God as human. God among us. As he grew tired, angry, frustrated, or simply hungry, did he wish he could whip out his “God” card and just bypass all this? In a letter to the church in Philippi, Paul describes what Jesus did in the following words: He emptied himself. Paul then traces Jesus’ downward spiral into becoming human, a slave, and finally death on the cross. He then traces the upward travel from resurrection to reigning supreme over all creation in heaven. But this word has always made me pause. Jesus emptied himself. Did he stop being God? The answer must be no. It would not be possible to not be God at any point in time. Was he faking it? The answer again has to be no. The New Testament in all its books is clear that Jesus did feel hunger and pain. Jesus was born as an actual baby. Jesus lived 33 years of human experience. Jesus did die a most shameful death on a cross. So no, he wasn’t faking it. Systematic theologians state that Jesus was entirely God and entirely human at the same time. Who is this God? He is certainly different that the other gods we read about. He is certainly different than humans. Humans and gods usually strive upwards. If they gain any status, no matter how small, they flaunt it for the whole world to see. Who is this God who chooses to empty himself? Who is this God who chooses to hedge himself into human nature? Who is this creator who chooses to become part of this creation? But this wasn’t a special case. God is not usually a God who does not empty himself, and then he chose to empty himself only once in Christ. No! The New Testament is clear. Jesus revealed the true nature of God. This is God! He is God on a cross! He is a God who dies for us, and not the other way around! God is not usually angry, distant, and hateful, but only for a few years he was a king dude walking around and preaching love. God has always been what we see in Jesus. God will always be what we see in Jesus. He is approachable, loving, merciful, kind, holy, sacrificial, dying…etc. He is a God becoming daily like us and near us, dying, to lift us up from our death to his life. Our very human nature screams for us to fill up and get more. The grace of God, in Jesus, whispers to us to lay low, kneel on the floor, and be emptied. There, in the pit on surrender, in the height of weakness, in death from self, we find Jesus in the cross. Then, with him, we rise from our death of sin into a life of love and constant emptying for others. This is part of the problems we face as a church. We love power. The cross has lost its richness of meaning. It is not just a place of sadness, or sacrifice. It is definitely not a place of power. The cross of Christ is Jesus dying like us. The cross of Christ is Jesus dying before us so we can follow him. Do not fight evil with evil, even if it kills you. We need to hear this in Lebanon, today, as our churches build huge buildings, and our Christian leaders strut around the government making laws and enforcing taboos (no civil marriage, really??). In this day, as the Christians in the Middle East call out for revenge against terrorists and many Christians arm themselves for war. In this day when we make a fight with our neighbour over a parking space, and curse the hell out of a stranger while we drive, we need to look at the cross and remember: it is not about power. 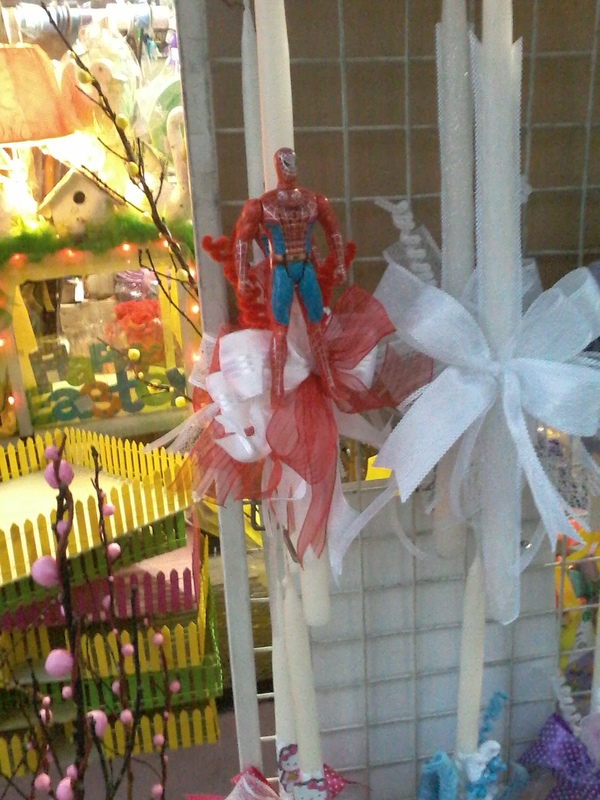 Who will you celebrate this Easter: Jesus the Spiderman or Jesus of Nazareth, the weak miracle-maker from Galilee? Perhaps if the church stopped running after power, we might find ourselves crucified for the rest of society. Perhaps then we will rise in victory over evil and death. And fight evil with evil. هذا جزء من المشكلة التي نواجهها ككنيسة. نحب السلطة. لقد فقد الصليب غنى معانيه الكثيرة. هو ليس فقط مكان حزن أو مكان تضحية. وهو بكل تأكيد ليس مكان سلطة. I have escaped my 9 child cousins and sit in an enclosed chamber writing this blog in Amman, Jordan (perhaps the fact that it is midnight has helped my escape). I am reminded this week that having a loving family is awesome, but it is even more awesome to have a family in the country I am attending a conference in! The cross is a sign of pity and sadness. The cross is God the Father killing God the son in our place so he would not be angry anymore. We discussed those three options in the first post on the meaning of the cross. Now, let me repeat. Yes, the cross is a symbol, is a sad place, and is Jesus carrying the sins of humanity. However, it is NOT only that. It is Jesus dying WITH us (first post) and more, much more. Many times we have an escapist mentality. Jesus died so I do not have to die. On some level that is true for in the cross of Jesus we find life. We will speak a bit about this in the second point. However, in its essence, Jesus’ death is him showing us the way. In a famous passage in Mark 8, just after Jesus had announced that he is to suffer and die, and just after Peter had rebuked him, Jesus declares: “if anyone would come after me, let him deny himself and take up his cross and follow me.” Jesus repeats that same command in different ways throughout Mark 8-10. His message is simple: following me is not a way to earthly power but a way of self-denial and death. Perhaps David Hayward says it best in this cartoon. So, what is the cross? It is Jesus dying before us so we can follow him unto death. The cross reminds us that we are called to be like Jesus in giving up everything for others. We are called to be like Jesus in choosing to walk against the wisdom of common sense and choosing to die in order to truly live. However, Jesus’ story does not end at the cross, and his death brings resurrection. As Paul continuously puts it, “we were buried therefore with him in baptism into death, in order that, just as Christ was raised from the dead by the glory of the Father, we too might walk in the newness of life” (Romans 6:4). Just as we are called to die like Jesus, we find ourselves for the first time alive like him too, in love to God and others. A love, just like his, that loves everyone no matter who they are, and is ready to continuously and daily die for them. That is the life we live, a life of daily death and resurrection. As we prepare ourselves in this Lent season to remember and celebrate the death and resurrection of Jesus, I thought I would write a series of blogs, leading up to Easter, on the different meanings of the cross. Now they are not actually 1000, but you have to give it that the number 1000 is attractive. (A) The cross is a piece of decoration. People wear it around their neck for show. Others wear it as a sign of power (irony alert: the cross is used to justify killing people whom Jesus died for on the cross). As happened for instance during the Lebanese civil war when some militias used the cross as their sign while they went around proclaiming their own kingdom using violence. (B) The cross is a sign of pity. 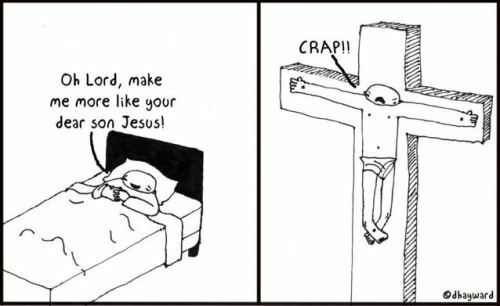 Poor Jesus, dying that terrible death on the cross. Let’s all wear black and cry, or better still, let’s make a 2-hour movie showing him being beaten in every possible way and the blood coming out of his body from every possible place. Yes, the cross of Jesus is a place of sadness, but it is not only that. (C) The cross is Jesus paying for our sins. Alright, yes, this is one face of the cross. It is not the only one. If our main Christian narrative is God the Father killing his own son to appease his anger then we have a missing narrative. He could have killed him as a baby and bam, his anger is appeased. Yes, Jesus died for our sins, but the cross has a 1000 more meanings. 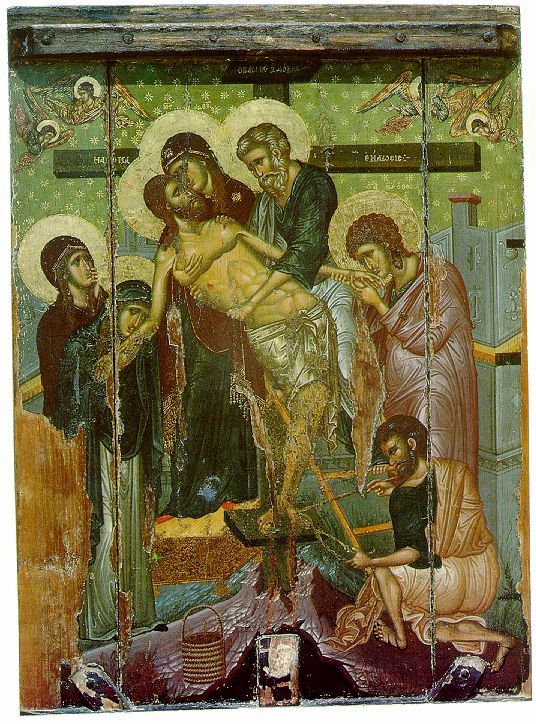 This is a 14th century Byzantine icon showing Jesus’ body being removed from the cross from the Church of Saint Marina in Kalopanagiotis, Cyprus. I love it because it shows his humanity. His dead body reminds us of the 21 Coptic Christians killed by extremists in Libya. His dead body reminds us of the 200+ Assyrian Christians kidnapped and waiting for their fate. His dead body reminds us of the countless millions who suffered and died throughout the centuries for their faith. His dead body reminds us of every pain, tear, and time of sadness in this life. His dead body reminds us that we are human, and humans die. It also tells us every time we die God dies with us and we are not alone. In it we see death.